The F5021 is ideal for small-to-mid sized systems for public safety, large industry to light commercial users. The F5021 offers multiple signaling, advanced scanning, improved external channel control capability and wide frequency coverage packed in a compact body. This rugged mobile easily exceeds your expectations with its reliable performance and communication quality. The tough aluminum die-cast chassis and polycarbonate front panel have been tested to the MIL standard 810F. With this heavy-duty construction, the F5021 provides reliable operation over the long term in all manners of rugged environments. Use the built-in 2-Tone, 5-Tone, CTCSS and DTCS capabilities as standard to set up your own talk groups, PTT ID and quiet stand-by when others are talking. The F5021 has added CTCSS/DTCS high speed decode and 2-Tone decode accuracy. The 5021 has a 40–pin option slot for adding an optional unit. Optional voice scrambler units, UT-109R or UT-110R provide secure private conversation. Optional DTMF decoder unit, UT-108R offers DTMF decode capability. With the optional OPC-1939 D-SUB 15-pin ACC cable, the F5021 can be programmed to control an operating channel from an external device (up to 16 preprogrammed channels). 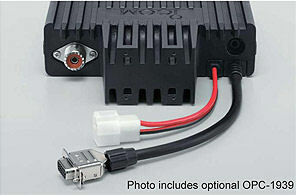 The ACC connector also provides an ignition sensing function, external PTT, PC command, honk honk, audio output and modulated signal input depending on programming. 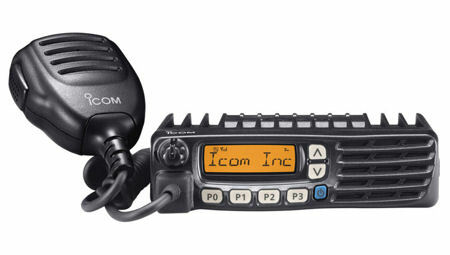 The F5021 is designed to be a companion to our F3021 series handheld transceiver. The number of channels and banks, signaling formats, programming software and voice scrambler are compatible. Take advantage of the shared functionality to complete your communications requirements.